Methow Housing Trust’s Canyon Street Neighborhood. 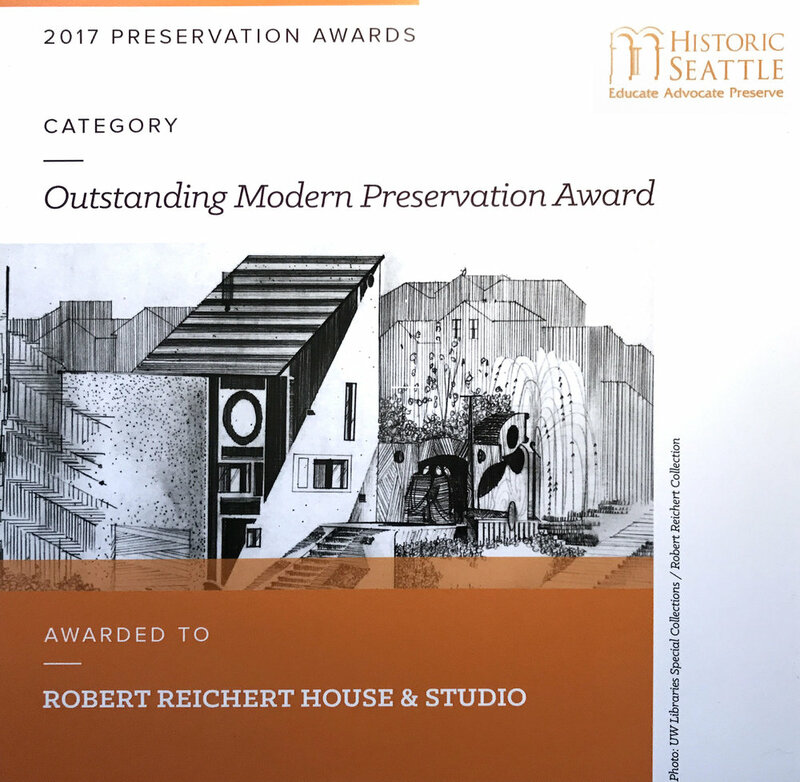 Congratulations to the whole Team and a huge thanks to Historic Seattle for the the recognition of the Robert Reichert House and Studio with the 2017 Outstanding Modern Preservation award last night! Stefan Hampden, principal & Brian Campbell, associate. Historic Seattle Dinner and awards ceremony at Washington Hall. Interior stairs with view of "door to heaven"
Ahh, the question that keeps re-modelers awake at night. It may seem like an achievable idea but trying to maintain a normal lifestyle in the middle of a construction zone is a test for most families. Before you commit to this restless journey we encourage you to consider the following complications. A general breakdown of the positives and negatives of remaining in your home. Also of consideration when living in a construction zone is the associated health risks. The severity of this exposure is dependent on several factors including how well the construction area can be sealed and the age of the home being renovated. Homes that pre-date the 1970's are extremely likely to contain lead paint which can pose serious health hazards; especially for young children. If the area of remodel can be completely quarantined then it's worth further consideration, but if your separation plan is a thin plastic sheet, start packing your bags. The final significant consideration is all about you; well your sanity. You will have an exclusive front row seat to the destruction and chaos occurring in your own home. Yes, you are excited about a transformation but being privy to the raw construction process may result in more stress than intrigue. This again is dependent on the level of compartmentalization achievable and your temperament. If you are asking our opinion here it is - if you have kids, and are renovating your kitchen plus a few other spaces - GO. If you are not remodeling with children in tow and the area of construction can be sectioned off then consider staying. The potential for monetary savings is limited but the metal taxation is real so take some time to think about the trade-offs. Still can't decide? Use the diagram below to figure out your situation. The Future of Seattle's Tomatoes in doubt? Will Seattle’s move to make more Backyard Cottages lead to a more sustainable city or just amplify environmental impacts? You might think that more DADUs would lead to more environmental impacts—after all, construction takes fantastic amounts of resources (including capital). Being in the backyard, DADUs should increase of impervious area, lead to the loss of tree canopy, compound parking conflicts, and stretch City services even thinner, right? Isn’t the shadow of neighbor’s potential cottage going to forever keep me from growing the perfect heirloom tomato? Last month, Marty Kaplan, under the aegis of the Queen Anne Community Council QACC, appealed a SEPA Determination of Non-Significance (DNS) with regard to changing certain characteristics of the Accessory Dwelling code. Right off the bat, it is important to clarify that a DNS doesn’t state that there will be zero environmental impact, but as city wide code, it is impossible to evaluate impact on each individual lot without a real project associated with the lot. This is a ‘Non-Project Action.” While you may be affected by something built next door, until there is a project conceived there, the City has no method to evaluate its environmental impact. In fact, the original backyard cottage ordinance was given a DNS, an inconvenient fact not lost on the Kaplan, since he helped craft it while on the Planning Commission. Today I finished testifying on behalf of the City on the Appeal, to establish a plain truth: Even if the City could evaluate the site by site impacts, they would show the City allows any single house to be much larger than any combination of house + DADU. Additional DADUs or larger DADUs are a reduction of environmental impact in comparison. Furthermore, the number of people allowed to live there stays the same (8 people per lot), although more of them would be new renters much to QACC’s dismay. Energy code, tree protections, stormwater code, etc all stay the same under the new code. The impervious area actually goes down--by eliminating the parking requirement. How can there be significant environmental impacts, if the rest of the code is identical and the only difference is the number of families (not people allowed) per lot? The SF zone is a zero sum environment—there is only so much buildable area, and if you choose to build a cottage, its lot coverage must deduct from the maximum size of the main house. And because it can’t be as tall, there is less available volume. It is a prima facia case, and in my mind, underlines the DNS. As a proxy for all the land use regulations, we created a schematic diagram to illustrate the potential buildable envelop as a single family house, house with an accessory structure, and a house with a DADU. We repeated the diagram under the new ordinance. In all cases, the biggest volume was the solitary single family McMansion allowed by right today. You only need to walk by a tear down house replacement and a backyard cottage to understand how the argument about which is better per QACC’s concern about neighborhood character is inverted. The QACC’s exhibits inadvertently made this exact point by showing an entire street of adorable bungalows replaced en masse with windowless 35’ blocks, completely obscuring whatever cottages in the backyard. Which is where the tomatoes come in the picture. One witness testified that if the ordinance goes through, and cottages were built on all sides of his small lot (possible, but very, very improbable), there wouldn’t be any sunlight left for his tomatoes. He should be all for the new code—every new cottage built is a hedge against a speculative developer tearing down the old bungalow and putting up a maxed out single family house. And that which would really put his garden in the shade. Do you want a glass wall but don't want to feel exposed in your cottage? In this design, we've placed a rusted custom cut steel screen wall just in front of the cottage, which will eventually be overgrown by flowering vines, creating privacy for both cottage and house, soft dappled light in the main floor, and a custom element that gives the cottage a distinctive feel which is both natural and a little bit industrial. This second design takes advantage of a steep corner site to make a sunlit treehouse with a iconic form and stripped down modern details. The end of the gable house peers out at a mature maple and the Olympics in the background. The cottage has an inverted plan with vaulted living spaces up, and sleeping downstairs. The third one sits delicately between some large heritage trees (made much more difficult by the city's somewhat inchoate Tree preservation plan requirements). The big porch is a natural extension of the public spaces of the house, with the private spaces screening views to the primary residence. The Lichtenstein - John residence is nearing completion... This project was a complete renovation and addition to a classic farmhouse in Ballard. Care was taken to preserve the character of the home while adding much needed space, updating the layout to provide better flow and connecting spaces for a more contemporary lifestyle. A glimpse of the covered veranda off of the kitchen and dining room is visible from the south facing street front. A new bathroom on the main floor finds a snug but workable home in what used to be a hallway. The renovated entryway opens up the original front porch that had been walled in. A new bathroom on the second story features a skylight and deep soaking tub. The renovation opened up the living room to connect it to the dining room and kitchen addition. For the third year running, CAST architecture was named as one of the best architects on Houzz.com. Now that the website has a database of more than 3 million photographs representing thousands of firms, it is more of an achievement than ever before. Thanks to all our great clients for continuing to bring fresh challenges! We're looking forward to a great 2015!